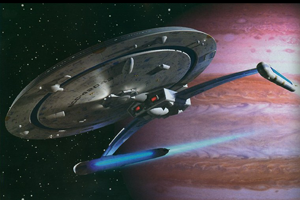 Designed in the early 2320s as a complement to the existing Excelsior-class and the forthcoming Ambassador-class Starships, the Centaur-class resembles the NX class ships that were the mainstay of Earth's Starfleet before the foundation of the Federation. Like the mythical hybridised creature that the design was named for, the Centaur-class utilised some of the better design elements from two distinct classes of Starship, the Excelsior and the Miranda, in addition to utilising new design elements that would eventually see their way to newer Starship designs for decades to come. The original design brief was for a medium-sized ship capable which utilised the latest innovations in Federation technology that could mainly serve Starfleet in a defensive capacity but could also take on less taxing assignments, freeing up the larger, mission specific ship classes. Another request was this new class of ship would require a small crew, have fewer resources and have a shorter build time than such classes as the Excelsior, Constellation and the Ambassador. The design team borrowed from the Miranda-class concept for their design, but based the ship off of a mixture of both Miranda and Excelsior-class components. The ship was given a forward Shuttlebay, which also helped shield the bridge from enemy fire in case of shield failure. This unique placement also allowed for rapid deployment of attack or rescue craft towards the ship's destination or target. Having only the one Shuttlebay would normally mean a small complement of support craft, but the large capacity of the bay allows it to carry a larger complement when necessary. This design element eventually led to the thru-deck shuttlebay design found on the Akira-class design. The ship's design is centred on a downsized version of the Excelsior-class saucer, so the internal arrangement is similar in the crew areas. The ship's dual-mount Phaser bank emplacements are arranged with 4 on the dorsal saucer, 5 on the ventral saucer, totalling in 18 individual phasers. The torpedo pod which was originally designed for the Miranda-class utilises 2 forward-firing torpedo launchers and 2 aft-firing launchers. The Centaur has surprising manoeuvrability for its size and era, surpassing the Miranda-class and rivalling the newer Intrepid-class in combat situations. This has given the ship a high survival rate in massed-fleet combats, though it doesn't fare quite as well in one-on-one engagements. In this role it is an excellent fleet-support ship, being able to defend larger ships against attacks from smaller enemies and draw the fire of large cruisers. The Centaur has proven itself effective at border patrol and anti-pirate activities, and more recently in the Cardassian and Dominion wars as a fast attack ship. It has also proven itself effective in convoy harassment and raids, being able to use its manoeuvrability and speed to perform hit and run attacks and take minimal damage itself. The many design features utilised in the Centaur paved the way for the Steamrunner and Akira-classes, with many Engineers firmly believing that the Akira-class designs wouldn't exist if not for the Centaur. Along with its battle capabilities, the Centaur has proven a solid platform for scientific operations of varying natures. Several Centaur-class ships have been involved in planetary surveys and archaeological expeditions. Their easily accessible cargo areas also provide an excellent capability for transporting tools, supplies and equipment.